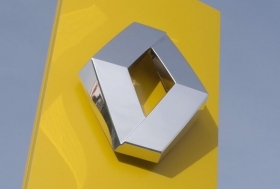 MUNICH – Renault brand passed the Fiat and Opel brands to finish the first quarter No. 3 in European new-car registrations. The French automaker did this by making the biggest quarterly gain among the region's leading mass-market automakers, according to data from European automakers association ACEA. Last year at this time Renault ranked fifth behind the Volkswagen, Ford, Opel and Fiat brands. The rankings now show VW in the lead followed by Ford, Renault, Peugeot and Fiat. Opel has slipped to sixth place. Germany was Europe's top sales market in March and Q1 despite declines of more than 20 percent during the month and the quarter.